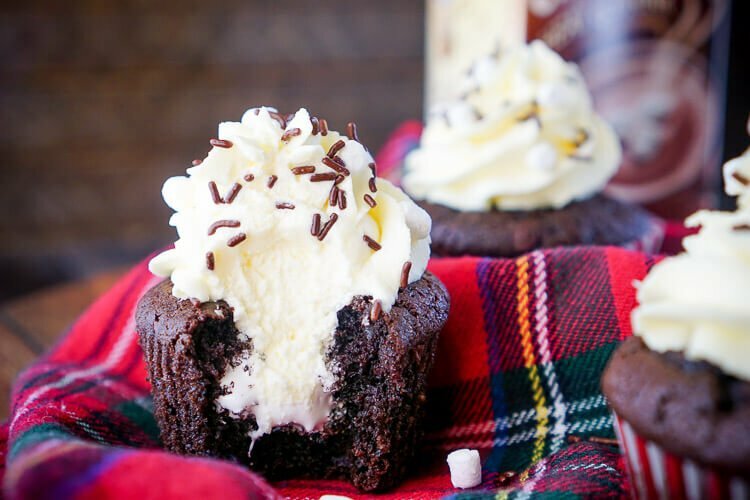 These Hot Chocolate Cupcakes are made with actual hot chocolate in the batter, filled with marshmallow fluff, and finished with a vanilla whipped cream frosting! 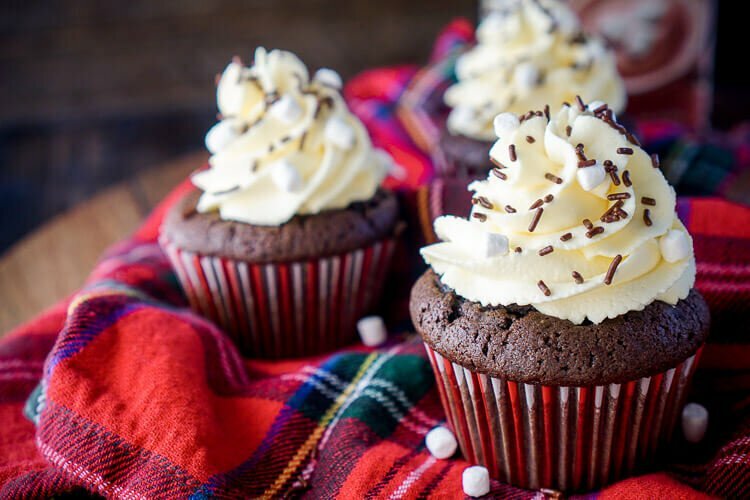 These Hot Chocolate Cupcakes are a fun and delicious winter-time treat the whole family will enjoy! Hot Chocolate. We all pretty much grew up on it in the winter time, most of us were probably mixing those packets with water or milk by the time we were three. But we’re adults now, and whisking out lumps of powder isn’t something we love doing, ain’t nobody got time for that! But it’s okay, all is not lost! International Delight now makes Hot Chocolate that you just have to Heat & Drink! Ummm… AWESOME! And it comes in both Milk and Dark Chocolate too, but you want to know what’s even better? These hot chocolates are not only delicious on their own but since they’re made with real milk, they’re perfect for making baked goods! If you can’t find this product, just use chocolate milk. 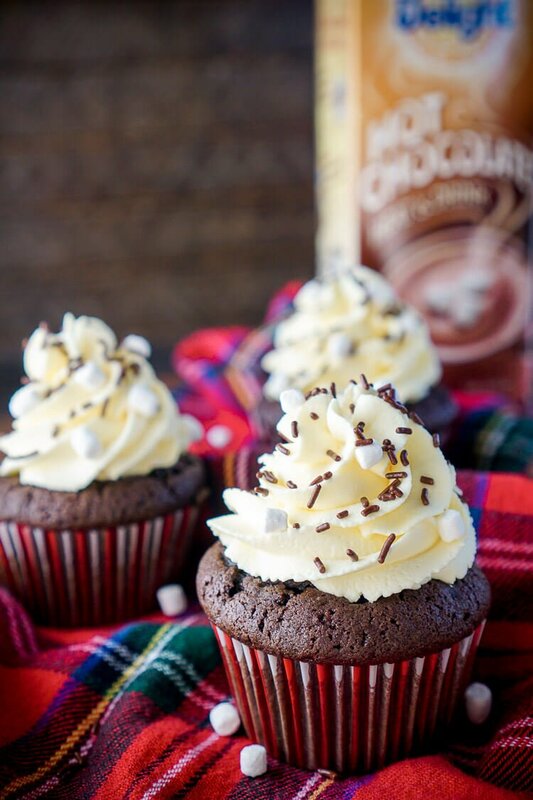 Which brings me to these hot chocolate cupcakes. 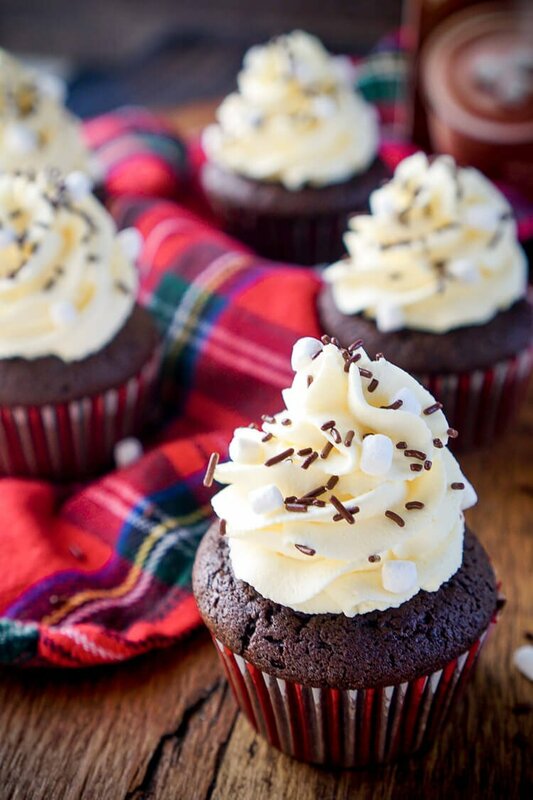 These moist, rich, chocolaty, fluff-filled, and whipped cream frosted cupcakes. With all that extra time you save from whisking, you can make these cupcakes! Okay, okay, the whisking wasn’t that bad and doesn’t take THAT much time, but these cupcakes take less than an hour to make and they’re definitely worth it! I sent these hot chocolate cupcakes to my Mom’s office yesterday and had several comments last night about how amazing they were and some of them even ate TWO! I think that’s a strong indicator that you need to make these cupcakes pronto! 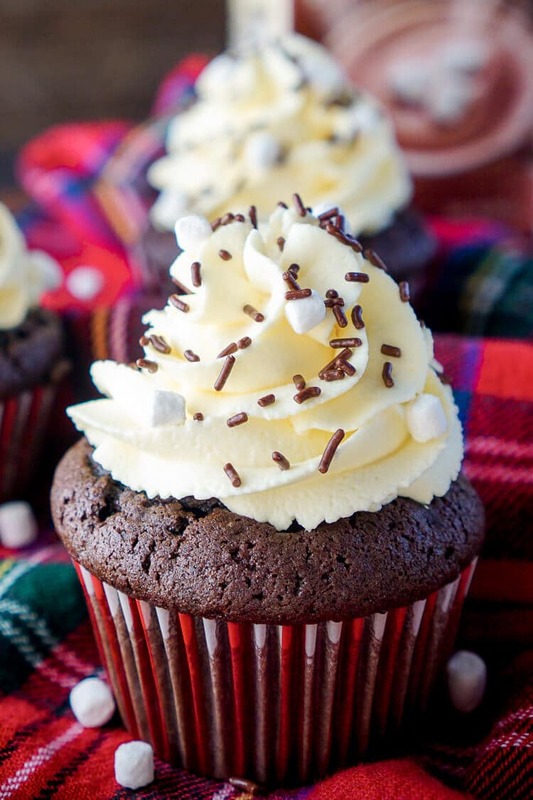 Pin this Hot Chocolate Cupcakes Recipe for Later! Watch how to make these cupcakes in the video below! Combine cupcake ingredients in mixing bowl and beat until well combined, making sure to scrape down the sides as needed. Add about 1/4 cup of batter to each liner so they're about ¾ full. Bake cupcakes for about 18-20 minutes until toothpick comes clean. Let set in pan for a couple of minutes before transferring to oven rack to finish cooling. Core out the center of the cupcakes and pipe in fluff until each is full. Combine heavy cream, powdered sugar, and pudding mix in mixing bowl and beat until stiff peaks form. Pipe frosting onto cupcakes and sprinkle with sprinkles and mini marshmallows. The hot chocolate can be added when warm, chocolate milk can be added cold or at room temperature. I can’t find any of the pre-made hot chocolate near me. Can I just mix up some hot chocolate (with milk), chill it, and then use that? Hi Alexis, chances are it won’t be out for a few more weeks, so yes, you can go ahead and make some yourself or you can also use milk. How much vanilla instant pudding do you use? I made these yesterday, they were so good! I use regular hot chocolate since I couldn’t find the premade stuff either. However, I think there’s a typo in your frosting. It was so runny we added a lot more powdered sugar and still couldn’t get it to come together. I ended up dumping out half of it and then adding enough powdered sugar to make it stiff. I think next time I’m going to try half a cup of heavy cream, and 2 cups of powdered sugar. Anyway, once we finally got the frosting to work it was delicious! The frosting recipe is correct, that frosting is the recipe I make most in my kitchen since I use it on a lot of baked goods. Can I ask how you tried making it? Stand mixer, hand mixer? Because it’s heavy cream it needs to be beat at a high speed for several minutes to fluff up, just like whipped cream. Kitchen aid. We mixed it on high for 15 minutes and it still just looked like soupy pudding. I know we measured everything correctly, and double checked that it was instant pudding. So strange. Anyway, it turned out really good in the end once I stiffened it with powdered sugar. The frosting worked beautifully this time! No idea what went wrong the first time we made it. I definitely whipped on high this time. We really love these cupcakes, thanks for sharing! So glad it worked out, I love that frosting and would hate for you to miss out! I accidentally bought table cream instead of whipping cream once and encountered this same problem. Hi, I was wondering how the frosting holds up? Do you refrigerate your cupcakes? I was thinking of maybe using a little meringue powder but didn’t want to mess up a good thing if it wasn’t needed. Hi Stacy, the frosting is a stabilized whipped cream, it holds it form fine, but shouldn’t be left near heat and should be refrigerated at night if there are leftovers. The frosting is best consumed closest to making it. I’ve never used meringue powder with this frosting so I can’t speak to how it would impact it. But I can promise you the frosting is really delicious as is, light, fluffy, and vanilla-y! Hi Deb, I have never made this exact recipe as a cake or on a jelly roll pan, but I’ve made a very similar chocolate cake. Mix the batter according to the directions in this recipe, line the bottoms of 2 (9 or 10-inch) cake pans with parchment circles and spray with cooking spray. Divide the batter evenly between the two pans and bake at 350 F for 40 to 50 minutes. I’m sure this would work in a jelly roll pan as well, I normally bake for 22 to 25 minutes in those for my chocolate cakes. 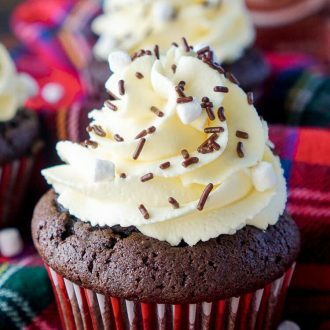 Hi Rebecca, Just came across your Hot Chocolate Cupcakes on Pinterest and they look delish! Am going to attempt to bake them but had one question for you about the batter mix, and it may seem silly but I don’t want to ruin them after buying all of the ingredients. The recipe calls for either a half cup of hot chocolate or half cup of chocolate milk (which are typically two different temperatures… hot or cold). Will that temperature change make a difference in the consistency of the batter? Which did you use? And if using hot chocolate which I was planning, do I need to let it cool before putting it into the batter? Thank you in advance. Looking forward to making these. Hi Kristine, that’s actually a great question since the chocolate milk alternative is a new one. You can add the liquid anywhere between warm and cold. Hope that helps and you enjoy the cupcakes. My daughter and I made these tonight for her school’s fine arts night tomorrow. It made a few extra and we’re excited to try them a little later. I loved the frosting and I was glad see you mention how well it holds up. We frosted them tonight since we’ll be short on time getting there tomorrow. I was worried we made a mistake by frosting them early. I put them in the fridge “cross your fingers”! I hope you love them, Jessica. The frosting should be fine as long as it’s in the fridge overnight, it may not be quite as light and fluffy as it is when it’s fresh but will still be delicious. The longer the pudding in the frostijng sets the stiffer/firmer it tends to get. Hope everyone enjoys them tomorrow! Hi Anna, did you make sure to use instant pudding and no cook & serve? Also, you shouldn’t put any additional sugar in, this is a whipped cream based frosting so adding too much will weigh it down and potentially make it so it doesn’t whip up. There’s only 1/4 cup of pudding powder in the frosting so the whipped cream makes it fairly light in color. These cupcakes are SO good! I’ve made them for my grandchildren’s birthdays (to take to school) for the past couple of years and they always get rave reviews from the students AND the teachers! Perfect for winter days, too. I substitute chocolate milk for the hot chocolate – works perfectly. So glad you love the recipe, Catherine. It makes my heart so happy that you’ve made it so many times and came back to leave such a sweet comment! No doubt my family will surely love this!